Maria Romero Ramos is a versatile modern and historical violinist specializing in the performance practices from the Baroque and Classical periods. She switches comfortably between different styles of bows and performs on both gut and modern strings. Romero has performed in Europe, Asia, and North, Central and South America, in modern and period festivals and ensembles as soloist, leader, and collaborator, including the Princeton Festival Baroque Orchestra, Mountainside Baroque, Valley of the Moon Music Festival, Boston Early Music Festival, Bloomington Early Music Festival, Bloomington Bach Cantata Project, Music Angelica Baroque Orchestra, New Vintage Baroque, Indianapolis Baroque Orchestra, International Chamber Players, Michigan Bach Collective, Bourbon Baroque, and Orchester Wiener Akademie. She was a featured soloist with the Indianapolis Baroque Orchestra as winner of their Concerto Competition and made her debut in the Isaac Stern Auditorium stage at Carnegie Hall with the Sphinx Chamber Orchestra. Romero was on the faculty of the Indiana University Pre-college String Academy from 2015-18, where she worked extensively alongside pedagogue Mimi Zweig. 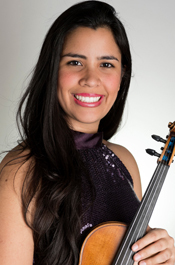 An alumna of Venezuela’s El Sistema music program, Romero is an advocate for social justice and empowerment through quality music education, and is actively involved with several organizations that help this cause. She has served as program director and development director for MusAid, which provides teacher training and instrument repair workshops to music schools in underserved communities around the world. She is also involved with the Sphinx Organization’s initiatives to promote diversity in the arts and with the Global Leaders Program to transform lives and communities through music. Romero is a candidate for the Doctor of Music degree in violin in the studio of Kevork Mardirossian at Indiana University, where she also obtained a M.M. degree. While at Indiana, she studied baroque violin with Stanley Ritchie and violin pedagogy with Mimi Zweig. Romero holds a Graduate Artist Certificate and B.M. degree from the University of North Texas under the of Julia Bushkova on the modern violín and Cynthia Roberts on the baroque violin, and the mentorship of lutenist Lyle Nordstrom. She also holds an Executive Graduate Certificate in Social Enterprise, Cultural Agency, Teaching Artistry, and Civic Leadership from the Global Leaders Program. Romero lives in Hendersonville, Tenn., with her husband, pianist Nicholas Reynolds.